San Antonio Professional Firefighter's Association President Chris Steele speaks at a press conference called by the union a day after secretly recorded audio was released by a campaign that opposes the charter amendments. During the news conference, Steele refused to answer questions about the tape. The union has three propositions on the November ballot that would alter the San Antonio City Charter. The union's news conference was called to address its reasons it did not participate in recently canceled debates. Debates hosted by the San Antonio Express-News and KSAT-12 were canceled after the news outlets said Steele canceled his appearance. “When any organization has reached out to us and asked us to attend … in some form or fashion whether or letter or text we have sent what you see here,” he said, holding up a letter. The letter was a request for a date or time a representative will be available to attend but does not name anyone specific. Multiple reporters asked Steele about the secret recording. “Chris, why is Greg Brockhouse your guy?” asked Brian Chasnoff, a columnist with the San Antonio-Express News. Steele ignored Chasnoff as well as repeated questions from the media throughout the nearly 30-minute briefing. Instead, two spokespeople for the San Antonio First campaign — David Van Os and Reinette King — answered for him. San Antonio First is the campaign supporting the amendments. “This is not about Chris Steele, this is about the citizens. And this is not about a leak. This is about the issues,” King said. Van Os added Steele has a right to talk to union members about political issues. 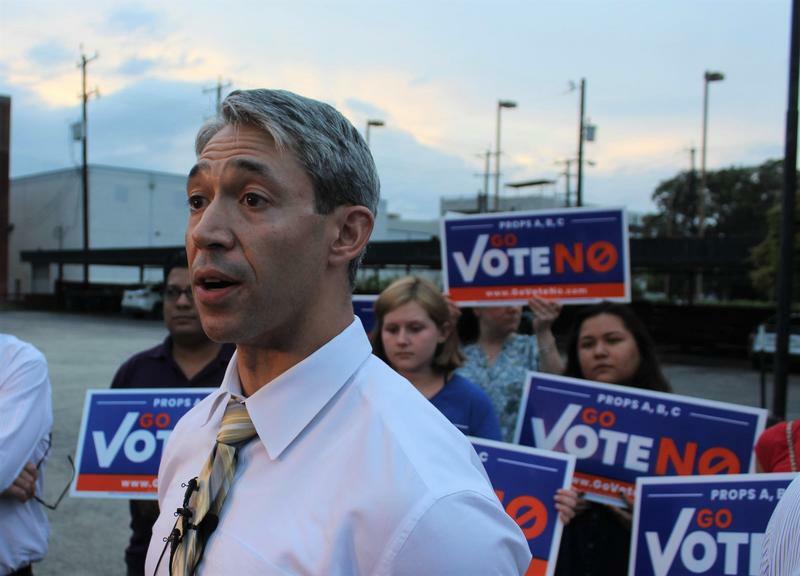 The Go Vote No Campaign, which opposes the San Antonio Professional Firefighters Association’s proposed amendments to the San Antonio city charter, has released secretly recorded audio that it says is the fire union president discussing the union’s ultimate goals. Registered voters in San Antonio will see three key propositions when filling out their ballot for the Nov. 6 election cycle. Updated Sept. 21, 4:45 p.m. with a statement from Bexar County Party Chair Monica Ramirez Alcantara. A day after an endorsement of city charter amendments, Bexar County Democratic Party Chair Monica Ramirez Alcantara said in a statement that the announcement had created "serious concerns" among the party’s county executive committee. A town hall about the San Antonio Professional Firefighters Association's proposed city charter amendments was abruptly canceled Thursday night after fire union president Chris Steele announced he would not attend. The San Antonio City Council gave final approval Thursday to place city charter amendments proposed by the San Antonio Professional Firefighters Association on the November ballot. The action was required because the amendments were driven by petitions.